Best store (online or IRL) to get Eccies? I had three Ecuadorians years ago and I really loved them, so I've been looking for some more (they sadly passed away due to a pesticide company mishap that ended up killing my entire crab population at the time). I've had no luck in local pet stores, and even pet stores in surrounding bigger cities. Is there any reliable place to get them online or should I try asking a local pet store if they can order some specifically for me? Re: Best store (online or IRL) to get Eccies? You could ask a local store... Just be prepared to have blank faces - a crab is a crab to them. Other than that, maybe a drive around 'town' and stop at a few places to see if any are in other stores? Unfortently, a lot of online stores seem to be bad businesses and I personally would never encourage one to shop with them. yeah, I’ve been doing some research and haven’t seen a single good place to order from, and I know that shipping is costly for me monetarily and for the crabs because it's so stressful, so I kinda figured asking around would be the way to go. Thank you both, though! I’ll see if I can somehow find a pet store that at least knows the difference between hermit crab types, or maybe I’ll get lucky and be able to adopt some! tofuthecrabmom wrote: yeah, I’ve been doing some research and haven’t seen a single good place to order from, and I know that shipping is costly for me monetarily and for the crabs because it's so stressful, so I kinda figured asking around would be the way to go. Thank you both, though! If you are in the U.S., Petco seems to get E's often. Just keep making the rounds and checking, if you ask they can tell you when new shipments come in. My first Es were from a pet shop that I had just called to see if they had any Es. The girl claimed to know what they were and that they did not have any. My hubby convinced me to jump in the car 45 minutes before they closed for a 35 minute drive there "just for the fun of it". I got five of them! They had no idea what they were talking about. I have about 3 Petsmart’s around us. I have found only 1 guy in the reptile section who actually knows about hermit crabs and reptiles - he brings his bearded dragon to work:) So, he has gotten to know me and what I’m looking for in hermies. He told me they usually get shipments of hermies into their stores on Fridays so if he found any E’s (very rare occasion) he would let me know. So, definitely ask around I’m also frequenting the adoptions feed here on the HCA. Good luck! The Petcos around here tend to get them, but it's hit or miss. A few years back one store had an entire tank full of them. this is super late but a new Petco opened up near my college campus and they carry E's! 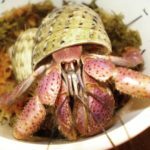 they classify them as the fancy hermit crabs though, which means most of them are in painted shells ;~; i bought two of them though, and the one that was in a painted shell almost immediately changed into a new natural one once he got settled in the tank, so everything is great! It took a while but you finally found them. Congrats! I have been looking for two E's since probably May. We are trying to find our Eddie some buddies since Cha-ly, and Vic died. I've been trying the adoption search more than local shops. Unfortunately my being in a somewhat rural area it is rare anything pops up. To the shops a crab a crab, unless its in a painted shell then it's more money.